Opera Australia is dedicated to making opera performances accessible to the Deaf and hard of hearing audiences, through our Auslan Shadow-interpreting program. In 2019 Opera Australia will offer Shadow-interpreted versions of its Schools touring production in both Victoria and New South Wales. Shadow-interpreting incorporates Auslan interpreters into the onstage action with stage direction & costumes, rather than having them stand to the side of the stage. The result is a much more comprehensive and exciting theatre-going experience for Deaf, hard of hearing and hearing audiences. This exciting program was originally developed with support from Deaf Children Australia, and is now entering its ninth year of schools touring. 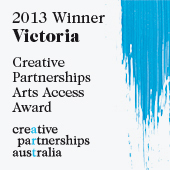 In 2013 Opera Australia was the Victorian winner of the Creative Partnerships Australia Arts Access Award for this program, and in 2014 Opera Australia was a finalist in the National Disability Awards for the Improving Inclusive and Accessible Communities Award. For more information, contact touring@opera.org.au.